Sophomores in the College of Social Studies (CSS) are currently in the midst of their comprehensive examination period, managing the challenges and excitement of the week. The intensive sophomore year for CSS majors, built around three tutorials and a colloquium, culminates with this weeklong examination period, known as comps, which pushes students to reflect on all the information that they have learned over the course of the year. The examination week is structured around 24-hour blocks of time over the course of a week, during which students are tasked with writing two essays per block of time in either economics, history, social theory, or government. A writing period is followed by a 24-hour break, and then students begin the next set of two essays. Comps are finished when all eight essays are completed. For some, the week is an exhilarating opportunity to test knowledge and consolidate the scattered stressful work completed during the year. For others, the week more closely resembles a kind of hell. Many students say they experience something in between. Other sophomores have had different experiences. Despite the isolated 24-hour essay writing, the chunks of time in between allow students to commiserate with one another and discuss their essays. Comps serves as a bonding period for the class as they tackle a common challenge. The experience of CSS sophomores can be similar to those of College of Letters (COL) majors, who undergo a similar comprehensive examination process. Although different in structure and content, as the major combines literature, philosophy, history, and language, the COL comps are similarly intensive. COL students’ comps are taken at the end of their junior year and cover all the material that majors have learned since the beginning of their sophomore year, after declaring the major at the end of their first year. Comps are taken from 9 a.m. to midnight three days back to back, during which each student writes two essays on each day, ending with 36 pages of writing after 72 hours. 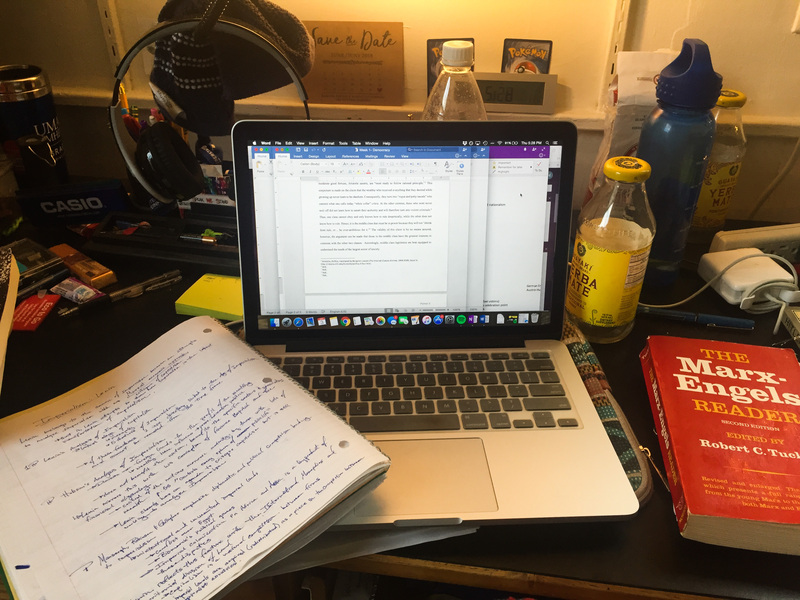 College of Letters (COL) major Emily Furnival ’18 shared her own experience with comprehensive exams during her junior year. Beyond the bonding quality inherent in the exams’ intense academic pressures, Sonya Bessalel ’18 emphasized that taking comps—and the COL colloquia in general—develops individual and peer-to-peer textual interpretation rather than professor-led thought. “Knowing that you’re going to revisit them changes the way you read texts,” Bessalel said. COL majors foster their analytical skills during their twice-weekly colloquia, in addition to out-of-class discussion in the COL library with professors and their peers. The two majors create a camaraderie among their suffering students, and comps provide an opportunity for students to share the writing abilities that they have nurtured and to reflect on what they’ve learned.